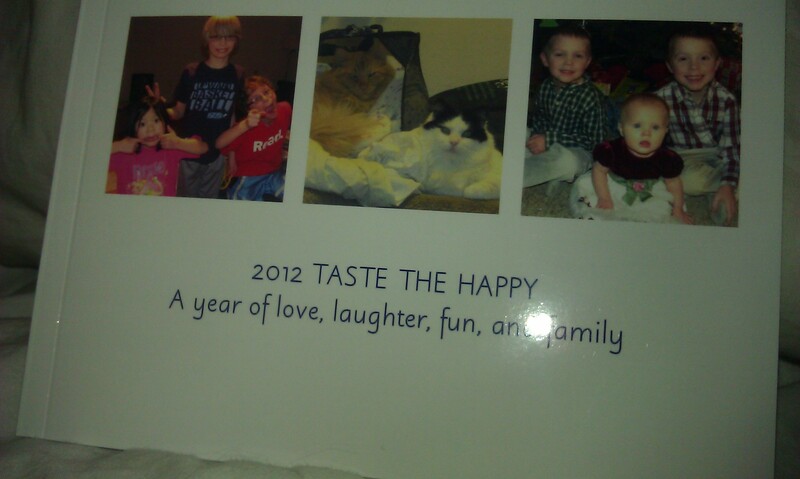 The cover of the first edition of 2012 TASTE THE HAPPY. After a quick page through, I know what changes I’m making for the second edition. My digital bragbook is finally here — a day late, I might add. The verdict? I’m a little surprised. Maybe I should’ve paid more attention to the dimensions before I decided to actually pay for it. Now, I understand why Walgreens offered the free deal on the smallest bragbook available. And I’m grateful I decided to use a 40% off coupon instead of paying full price like I originally intended. At the time, I thought all of my hard work would be well worth the full price, but I was going to be totally wrong and more upset with myself that I let my pride get in the way of a good deal. Oh well. The book is very small and very flat. Buuuuut, it’s portable and quick read. I like it, but I’m not quite convinced to give up my scrapbooking supplies. Overall, I love the bragbook because of the size and portability. I like the idea of digital scrapbooking, but I need more experience before completely ditching my scrapbooking supplies. A second attempt is needed before a final decision can be made. I already know what changes I want to make for the second edition of 2012: TASTE THE HAPPY (which by the way, is an “Arrested Development” reference). 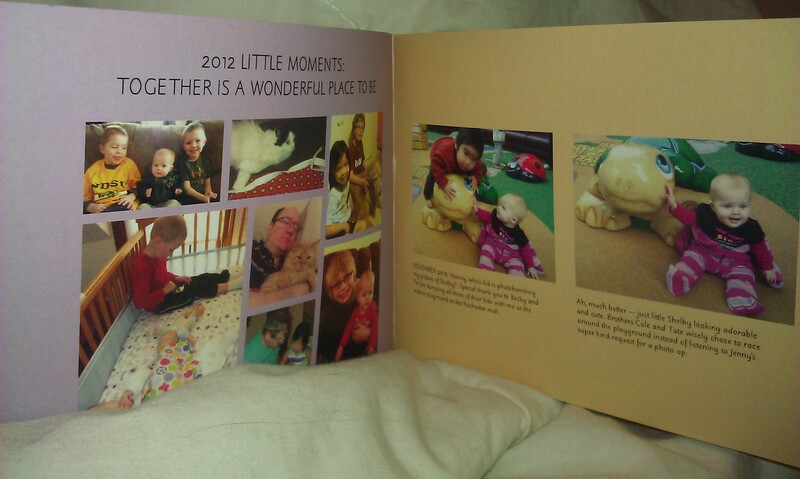 One, due to the book’s small size, pages should be limited to one to two pictures. As much as I love the multi-photo layout, the smaller pictures are really small. Two, the cutlines are really small — some people might need a magnifying glass. Three, I can do better. Now that I know what I’m working with, I can do better — much better. I just need some practice. In my heart, I want to move on to digital scrapbooking because I’ve been collecting quotes on Pinterest for future bragbook projects. I just need an amazingly fantastic bragbook to help me make that decision.